These Streusel Sour Cream Coffeecakes, baked in muffin tins are moist, rich and nutty with a wonderful orange flavor from the addition of orange zest. The recipe is from the February 2002 issue of Gourmet and it's my second contribution to the new site Gourmet Unbound . It received so many positive reviews that I just had to give it a try, and that was a month ago. I've been making these coffeecakes ever since! They're that good! The only change I made, was to spoon some of the streusel in between the layers of batter, rather than just on top. There is plenty of streusel topping to do this. ( Actually I didn't use all the topping, as there remained a bit more than I needed.). One last thing, if you fill the tins more than 2/3 full, the muffins will "mushroom" on top and this can make it a little tricky to get them out of the pan in one piece. Be sure to butter each tin liberally, sides and bottoms and top of the pan, too. Liberally butter each cup of a 12 cup muffin pan, sides, bottoms and top of the pan itself. 1. Stir sugar, flour, salt and 3/4 cup of brown sugar in a medium bowl. 2. Blend in 1 1/2 sticks of the butter with your fingers to a coarse meal. 3. Transfer 3/4 cup of the mixture to another small bowl and add cinnamon, remaining 1/2 stick butter and remaining 1/4 cup brown sugar. Blend with fingers to combine. 4. Stir in nuts. Chill topping 15 minutes. 5. In a small bowl, whisk sour cream, egg, egg yolk, vanilla, baking soda and orange zest. 6. Stir into remaining flour mixture til just combined. ( Batter will be stiff.). 7. Divide among the well buttered muffin cups, filling 2/3 full. (Or, fill a small amount of batter into muffin cups and sprinkle some streusel on top and spoon more batter over this). 8. 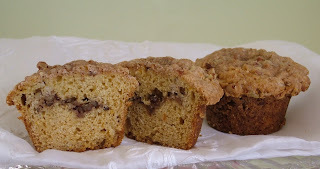 Sprinkle each muffin with streusel topping, pressing it lightly into batter. 9. Place rack in middle position in oven and bake for 20 to 25 minutes, or til toothpick comes out clean. 10. Allow muffins to cool in pan. They will come out easier once cooled totally. * Note: I haven't yet tried using paper liners but if you do I suggest spraying each one with a butter spray. While trying to regroup after a very busy, hectic weekend, my computer decided it was time to come down with a serious illness ( dare I say virus). So this morning it was rushed to the "emergency" room, aka, the computer repair shop, where it will undergo a series of tests to make it all better! In short, it needed cleaning up and I have to rely on my son's computer to post, without sadly, any photos. My busy hectic weekend involved preparing to sell at a flea market/antique show, depending, I guess, on whether you consider your "stuff" as having any real value or if you think it's just junk and you'd like to get rid of it, at any cost..or actually at almost no cost! Then, of course, I had to bake for the farmer's market this weekend also. By later in the second day of the flea market, the buying really slows down, and you count the hours, or minutes, til you can start packing up. This is about when I look for something to pass the time. Anything will do, a magazine or perhaps a book. I wandered over to a neighboring table where they were selling books for a dollar and my eyes fell onto a book titled " Home Cooking, A Writer in the Kitchen" by Laurie Colwin. Hmm, I thought to myself, there's something so familiar about that name. And anything remotely related to food these days interests me. Thinking back to the moment I first saw this little gem of a book, I guess I thought I was just buying another cookbook. I didn't even look at any of the pages inside the book. I merely glanced at the title, briefly read a few sentences on the front and back cover and, pleased with my dollar purchase, scurried back to my chair, satisfied that I had found something to make the next few hours fly by! I opened the book, quickly read the table of contents, read the foreword and settled back to read, what I thought, were going to be recipes. Well, can I just say, she had me hooked after reading just the first few sentences. I immediately knew this book was something special. You have to understand that I'm fairly new to this whole food blog thing. And the more I research recipes, other blogs, food magazines, etc., the more I learn about who's who and what's what in the foodie world. So, having said that, I need you to understand that I still didn't really know who this Laurie Colwin was. I do remember thinking that I must have read her name mentioned on a few blogs, so she must be another one of those great cooks or bakers, like a Dorie Greenspan type that's out there. Well to say that I couldn't put the book down would be an understatement. When anyone actually approached my table in those last few hours, I tried not to treat them as the annoyance they were at that moment. Why were they interrupting me? Didn't they see I was deeply engrossed and didn't wish to be disturbed? After I packed up all my things, finished out the day and finally had time to pick up the book again, I read a few more wonderful chapters and found myself wondering about this author. I turned the book to the back cover and decided I should take the time to read all that was printed on the back. I read the little blurb next to her photo about all her other works..and then I read this " She died in 1992." Suddenly, I felt as if I'd just found out a good friend had died. I couldn't believe I hadn't read this before now. Thoughts of how she never lived long enough to experience all that was to come in the food world, no more wonderful stories from her about the tiny apartment she says in the book that was " a little larger than the Columbia Encyclopedia"! Where she had not even a kitchen sink and she had to wash all her dishes and pots and pans in the bathtub! All this talent, this style of writing that makes you feel like she's an old friend. An easy going style that pulls you in, to share her humorous stories, all this, cut short. How sad. So, I urge you to make it a point to acquire not only this book but her others, as I intend, such as the book published a year after her death, " More Home Cooking". I think she would be happy to know we still love her stories and look forward to trying each and every one of her recipes! Once that computer comes back to life we've got a Nantucket Cranberry Pie recipe to make! The best thing about making your own granola bars, aside from the cost savings, is that you can control exactly what ingredients go in them. I have been making these homemade granola bars for quite a while now and they're the perfect portable snack! Believe me when I say this. My son, Kris, loves to grab one to throw in his backpack to help get him through the day and everyone who tries them agrees they're amazing! I first read the recipe here and still use pretty much that original recipe but I've made a few changes. I didn't want a too sweet granola bar. I mean, all that sweetness is kind of counter productive to the purpose of eating a healthy granola bar. Right? So I cut down on the original sugar amount. Another great thing about these bars is that you can switch out one kind of nut for another or change the dried fruits, using from no dried fruits to one or two. Our favorite combo around here is raisins and dried cranberries. But that's not to say dried cherries or apricots wouldn't be terrific..or how about a combo of dried cherries and mini chocolate chips..or apricots and almonds..or..whoa! Somebody stop me! You can also make spice granola bars. I've added the spice amounts at the end of the full recipe below. So I guess you get the idea. Make them with whatever you like in them. But the point is, make them! Begin by placing the peanuts into your food processor and pulse a few times to get them nicely chopped, but not too fine. You still want some a little larger than others. Then into a baking sheet, place the oats, nuts, wheat germ and sunflower seeds. Bake 10 to 15 minutes, stirring occasionally. While the oat mixture is baking, place the brown sugar, honey ( I use a wildflower honey which explains the dark color being poured into the pan), butter ( yes,it has butter but only 4 tablespoons for the whole batch! ), vanilla and salt into a medium pan and heat, over low heat, til the mixture is warmed, stirring constantly. Once the oat mixture is baked, dump it into a medium or large bowl and add the dried fruits. Pour the wet mixture into the oat mixture and stir. Prepare an 11" by 13" glass pan by spraying with Pam, then lining with either plastic wrap or waxed paper. Then spray that. Dump the mixture into the glass pan and spread out with a spoon. Grab a piece of plastic wrap or waxed paper and spray with Pam. Spread the mixture evenly pressing down as you spread. Then just let it sit a few hours and you've got , depending on the size you cut, a dozen bars. Wrap them individually. They keep like this for quite a while, like a week or two. 1. Pulse peanuts in food processor. 2. On a baking sheet, mix oats, nuts, wheat germ, sunflower seeds. 3. Bake 10 to 15 minutes, stirring occasionally. 4. Spray an 11" by 13" glass pan with Pam and line with waxd paper or plastic wrap. Spray that with Pam. 5. Into a medium pan, place brown sugar, honey, butter, vanilla and salt. Bring to simmer and stir constantly til the mixture is all dissolved. 6. Once the oat mixture is browned, place into a medium or large bowl with the dried fruits. 7. Pour the wet mix over the oat mix and stir to combine all. 8. Place this mixture into the prepared pan and spread with a spoon. Then take a piece of waxed paper or plastic wrap and spray with a little Pam. Spread the mix, pressing down as you spread. 9. Set it aside for 2 to 3 hours. Then lift it out, ( for easier cutting), using the paper to lift and cut into sizes of bars you like, using a heavy knife. 10. Wrap each bar individually. Throw a few into your purse! Or your kids backpack! how much you like the flavors. So as I was saying in yesterday's post, I have tons of lemons and...I'm sorry..did you think I was kidding about making the Lemon Curd, or something else lemony? Nope, I was serious! As luck would have it I actually found an old issue of Martha Stewart's Magazine from June 2009 in my local thrift shop yesterday( heck, they're only 50 cents each!) And this is so much better ( cheaper,too!) than buying the curd at the store, right? And she had this Lemon Curd recipe in the magazine, along with her Blueberry Buttermilk Scone recipe. Seems to be a recurring combo of scones with curd. This curd recipe really is so easy to make and it's tart and sweet and so delicious. So begin by whisking together, in a medium heavy saucepan, the egg, yolks, sugar, lemon zest and salt. Bring it to a simmer over medium heat, whisking constantly. Cook until mixture is thickened , about 5 minutes. Strain through a fine sieve or strainer into a bowl, pressing the mixture through with a heavy spoon. Whisk in the pieces of butter. And that's it! Just be sure to cover with plastic, pressing the plastic on top of the surface of the curd. Refridgerate until cold, at least one hour or overnight. Now pardon me while I go make some blueberry scones to go with it! 4 tbsp. unsalted butter, cut into pieces. 1. 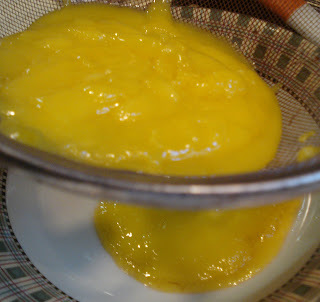 In a medium heavy saucepan, whisk together egg, yolks, sugar, lemon zest , lemon juice and salt. 2. Bring to a simmer over medium heat, whisking constantly. Cook til mixture is thickened, about 5 minutes. 3. Strain through a fine sieve or strainer, pushing the curd through with a heavy spoon, into a bowl. 4. Whisk in butter pieces. 5. Press plastic wrap directly onto surface of curd and refridgerate for at least 1 hour or overnight. The other day my local market had for sale ( and on sale), tons of packaged up lemons. I'm talking about 10 lemons per package for like way way less than a dollar! So, there was no way I could leave all those lemons there for someone else! Nope. I had to have them..all! Now I'm on a mission to find some great recipes to make lemon everything. This lemon cookie is very much like a shortbread cookie with lemon in the dough but the extra kick of delicious lemony flavor comes from the glaze you dip or spoon on top, ( depending on the consistency you like). The cookies are wonderfully light, which comes from the combo of cornstarch and confectioners sugar. I urge you to give them a try. If you love lemon flavor, you'll love these! 5 tsp. lemon juice ( I used alot more to get it thinner. Just keep adding juice til you like the consistency). 1. Combine in a small bowl, flour, cornstarch and salt. 2. In mixer bowl, beat butter and sugar til creamy. 3. Beat in zest and extracts. 4. With mixer on low speed, add flour mixture and beat til combined. The mixture may seem dry at first but keep mixing on low and it will eventually come together and clean the sides of the mixer bowl. 5. Divide dough in half. 6. Roll out each half between 2 pieces of waxed paper to approx. 3/8" thickness. 7. 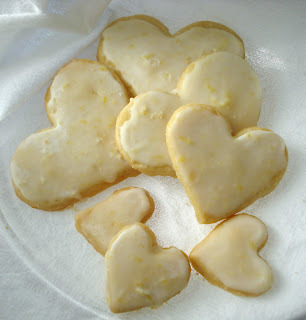 Cut out heart shapes ( I used 3 different sizes, just for the heck of it!). If the dough gets too soft, just pop it into the fridge for about 15 minutes. 8. Place 1" apart on ungreased baking sheets. ( I always sprinkle my ungreased sheets with a little sugar to prevent sticking). 9. Bake 15 minutes or til the edges brown slightly. Glaze: Mix confectioners sugar, juice and zest til well blended and the correct consistency. Dip cookie in glaze or spoon glaze on top of each cookie. Allow cookie to cool and the glaze to set. Place waxed paper between layers to store. Store in air tight containers for up to one week. Can be frozen up to one month. The first of this month I submitted a cookie recipe to Gourmet Unbound, a site dedicated to cooking and choosing recipes from Gourmet magazines past issues. Had I been aware of this site in December I probably would have chosen this Spoon Cookie recipe to submit. It's from a December 2005 issue of Gourmet. I was curious about the name and found myself looking it up just to see why it is called this. Turns out it's named this because you fill a spoon with the dough, press the dough down into the spoon and then slide out the formed dough. Well, ok..and here I thought, what? That it was made out of spoons? Kidding! But this cookie is a bit tricky. The most time consuming part of making this spoon cookie is browning the butter. If you've never done this before, take a look at this for a quick lesson. Or my photos, of course! These cookies are quite crumbly and delicate, but they are light and delicious. Just so you know, I halved the recipe. I figured just in case I botched the browning part, I would only be wasting one stick of butter. So start by browning the butter. To do this, melt the butter in a saucepan( I cheated and used a saute type of pan), over moderate heat. As the butter melts, it forms white foam on top. Tiny bubbles begin to form as the heat increases and the white foam starts to break up a little. After about 5 to 7 minutes the butter turns this nice golden color. Stir more at this point and once tiny specks appear on the bottom and the color is a nutty brown shade, take the pan off the heat and place into your sink filled with cold water. Oh, didn't I mention that? Yes, before you start the browning process, first fill your sink with about 2 inches of cold water. Placing the pan in the sink with cold water stops the cooking. Stir the butter. It will start to look opaque after a few minutes. Remove the pan from the sink and pour in the sugar and vanilla. Stir to combine the sugar and vanilla with the butter. Whisk flour, salt and soda in a small bowl and stir into the butter mixture til a dough forms. It will seem crumbly but it does come together. Shape the dough into a ball and wrap in plastic. Let it sit at room temp. for 1 to 2 hours for the flavor to develop. Preheat your oven to 325 and place your rack in the middle of the oven. The recipe originally said to scoop using a teaspoon. I thought this size was way too small so I used.. I used a half tablespoon spoon, measuring spoon that is. The particular measuring spoon I have has a nice shallow "bowl" and it's easy to slide the dough out. BTW, doesn't the dough in that photo above look kind of creepy?! Anyway, press the dough into the spoon, then slide it out carefully. It may want to crumble so if it does, just press it back in there and try again. They don't spread at all when baked. Let them cool 5 minutes on the cookie sheet, then transfer to a wire rack to cool completely. In the meantime, heat the fruit preserves you'll be using. I used black raspberry. Then go ahead and place some preserves onto the flat side of one cookie and top with another cookie to make a sandwich. Allow the filling to set. There is a note about the cookies that says they get much better after a few days. I'll have to hide them to find out if that's true since they're almost all gone already! 2 sticks of cold, unsalted butter, cut into pieces. 1. Melt butter in a 2 - 3 quart heavy saucepan,( I used a shallow saute type pan.) over moderate heat, and cook, stirring occasionally, til butter turns golden with a nut like fragrance and flecks on the bottom of the pan turn a rich caramel brown color, about 10 - 12 minutes. before butter begins to brown. Stir more frequently toward the end of cooking. 2. Place pan in sink of water, to stop the cooking and cool it down. Stir frequently til butter starts to look opaque, about 4 minutes. 3. Remove pan from sink and stir in sugar and vanilla. 4. In a small bowl, whisk flour, soda and salt. Stir into butter mixture til a dough forms. 5. Shape dough into a ball and wrap in plastic. Let it sit out at room temp. for 1 to 2 hours for the flavor to develop. 6. Preheat oven to 325 and place rack in middle of oven. Flatten out the top. Slide the dough out of the spoon and onto an ungreased cookie sheet with flat side down. ( Dough will feel crumbly). 8. Bake til pale golden. I found it took almost 15 - 18 minutes to bake. Cool on sheet 5 minutes then transfer to wire rack to cool completely. 9. Heat fruit preserves in a small saucepan over low heat til just runny. Pour through sieve, if needed, cool. 10. Spread cookie with preserves and top with another cookie. Let set 45 minutes. * Cookies get much better after a few days*. Cookies will keep in an air tight container for up to 2 weeks. Makes about 30 sandwich cookies ( teaspoon size). When I read that National Fig Newton day was coming on January 16th I knew I wouldn't be able to post the recipe that day so this, being the first chance I got, is my salute to the Fig Newton Cookie! Now, I have to admit, I've never really loved the cookie but we're talking, of course, about the store bought variety. And, well, there's just no comparison between a freshly baked homemade cookie and one that's been factory baked, assembly line packaged and stuffed in a bag to be consumed sometime within the next millenium. The recipe I decided to try was in all grams so I made the best comparison of grams to ounces I could and gave it my best shot. 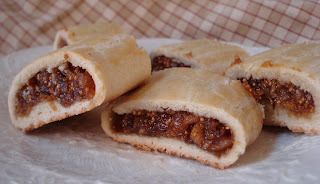 The result was a delightful pastry type cookie filled with a delicious flavorful fig filling that I not only loved, but my son, Kris, declared it was the best cookie he has ever eaten ! Well, yes, he does say that about alot of the cookies I bake but suffice to say he really, really loved it! I bet this cookie dough could be filled with another kind of filling, such as nuts and golden raisins or dates and nuts. Yes, I do think so! So let's get baking this fig newton, shall we? Begin by cutting the figs in half. Make sure you cut away that hard stem little piece that is on every one! Then coarsely chop them into approx. 1/2" pieces. 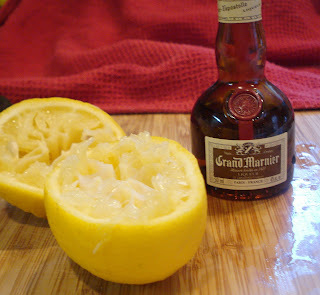 You're going to be adding the juice of a lemon and a little Grand Marnier to the figs. Again, I just have the airplane size of booze hanging around the house! Put the figs, sugar, water and lemon juice into a heavy saucepan and cook over low heat, stirring occasionally, til the figs begin to soften, adding the Grand Marnier at the end. You may need a little more water as they cook to prevent burning. Once the mixture has cooled slightly, place it into your food processor and pulse a few times to break down the figs more. Make the cookie dough. When ready, roll out half of the dough to about 1/8" thickness, between 2 pieces of waxed paper. Place half of the filling down the center of the dough. Smooth out the filling with the back of a spoon or with your fingers. Trim away any dough that extends too much along the top and bottom because once you fold each side over it should only just cover the filling. This is how it should look after you've folded both sides over the filling. Don't worry too much about the ends being closed up. The filling doesn't ooze out at the ends. Turn the log over and place onto parchment paper on a baking sheet. Brush the top with some egg wash.
Repeat with the other half of dough and filling and bake them in a 350 oven for about 15 minutes or til they begin to nicely brown. Let them cool on a wire rack. Slice into 1 1/2" pieces. 1. Cream butter and sugar til light and fluffy. 2. Add eggs, one at a time, mixing after each addition. 3. Add flour and salt mixture and beat on low to incorporate. 4. Divide the dough in half. 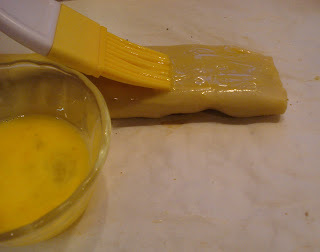 Place each piece of dough between 2 pieces of waxed paper and roll out to 1/8" thickness, to a size approx. 6" by 18". ( If too soft, chill dough about 20 minutes before rolling). 5. Make filling by coarsely chopping the figs into approx. 1/2" pieces. 6. 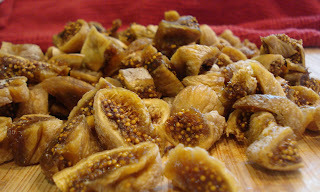 Place figs, sugar, water and juice into heavy medium saucepan. 7. Cook over low heat til figs soften, stirring occasionally. Add more water, if needed, to prevent burning. 8. Add the Grand Marnier and stir to combine. 9. 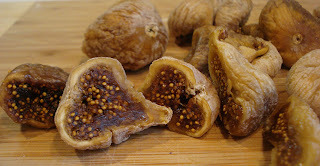 Let the mixture cool slightly, then place into a food processor and pulse a few times to break down the figs a bit more. 10. Place half of the filling down the center of the dough. The filling should measure the length of the dough by about 2" wide. Trim away any excess dough that may extend too much along the top and bottom. 11. Fold the dough over the filling at the top and bottom. 12. Turn the log over, so the seam side is underneath. Place onto a parchment paper lined cookie sheet. 13. Brush with egg wash and bake in a 350 oven for approx. 15 minutes, or til the log is nicely browned. 14. Let it cool slightly, then slice into 1 1/2" pieces while still a little warm. 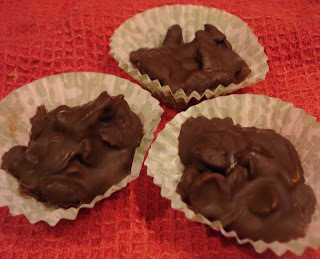 Here's a quick, really easy, but best of all, delicious recipe to make the best chocolate clusters. It's so easy, I hesitate to even call it a recipe! The add in's can be pretty much anything you like with chocolate from any kind of nut or dried fruit to coconut or marshmallows. And in this case, including cornflakes gives it an extra crunch. Just melt, double boiler method, a good quality dark chocolate. I used some good Belgian chocolate for mine. Start with about a generous 1/2 cup of chocolate. You can always add in more. Chop your chocolate into small pieces and place in a heat proof bowl over very low simmering water. Stir the chocolate occasionally til it melts. Be careful not to let the water get above a simmer. Once the chocolate is all melted, take the pan off the heat but keep the bowl over the water. Then just put the add in's into the melted chocolate and stir to combine. You can add as much or as little as you like. The cornflakes make a really nice crunchy cluster. If you like chunky bars, the combo of raisins and peanuts is great, too! Then scoop out teaspoonfuls and either place on waxed paper in clusters or, as my photo shows, I used small muffin paper cups. Refridgerate til set. A perfect Valentine's Gift! Yum!! 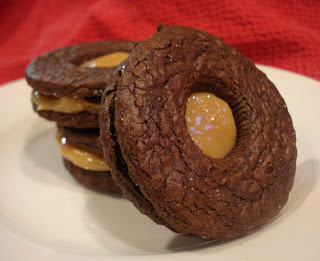 I was so focused on the filling of these Dulce de Leche Chocolate Cookies that I didn't realize I've posted 2 chocolate cookies in a row! Well, like the previous post, chocolate is great with not only with peanut butter, but also with this amazing rich caramel flavor. And, of course, with so many other flavor combos. The possibilities are endless! This is a Martha Stewart recipe for the chocolate cookie that I took from her October 2007 issue. She doesn't give the recipe for the dulce de leche with it but I happen to have made it yesterday using this recipe so I wanted to give this one a try. I was surprised that the cookie turned out so hard and crunchy, however it only uses 2 tablespoons of butter so that alone should have tipped me off to the texture. I'm kind of thinking a softer cookie would have been a better match for this filling. The cookie dough came together easily enough and the baking time was very short. At first I thought the recipe called for too much salt, but I did like the salty taste with the caramel taste. A kind of sweet and salty combo that works well together. One last thing, I could only get 16 cookies from a batch and I used the same 2" size called for in the recipe and kept them 1/8" thick. Any thicker than that would be too much for this sandwich cookie. So begin by beating the butter and sugars in a mixing bowl on medium speed til pale and fluffy. Beat in egg, yolk, chocolate and vanilla into the butter/sugar mix. Add the dry mixture and beat til just combined. The dough will be stiff. You'll need to loose the spatula and switch to a heavy spoon to scoop the dough out of the bowl. The recipe says to shape the dough into a disc and refridgerate for 1 hour. Ok, I found this to be an unnecessary step, although I did it this way, next time I'd just roll the dough out between 2 pieces of plastic wrap or waxed paper to the thickness needed, then refridgerate to chill the dough. This saves time and energy because, unless you want an upper body workout, you won't have to roll out the thick hard dough to the thin 1/8" needed! You can reroll the scraps til it's all used. I used my usual sugar sprinkled cookie sheet method. Martha's recipe calls for using parchment paper to cover the sheet. If you choose my method, just remember to loosen under each cookie immediately after taking out of the oven with a sturdy spatula or they'll probably never come off in one piece! One final word about the center cut out. I do not have, or ever plan to have, an aspic cutter set which she says to use for the cut out! ( They were originally called "Bat Cookies") I found something that seemed to be the right size in one of the drawers. It was the plastic collar piece that is used for the royal icing tip. Whatever you can find that will make a cut out is fine, even a knife will do! 2 tbsp. unsalted butter, room temp. 1. Whisk together flour, cocoa powder, salt and baking powder. 2. In mixing bowl, beat butter and sugars til pale and fluffy. 3. Beat in egg, yolk, chocolate and vanilla. 4. Reduce speed to low and add flour mixture. Beat til just combined. 7. Cut out rounds with a 2" cutter and place, 1" apart, on parchment lined cookie sheet. ( Or use my method sprinkling sugar on the sheet.). 8. Cut centers out of half of the cookies. Refridgerate again if they got too warm about 30 minutes. 9. Preheat oven to 375. Bake 7 minutes or til set. Immediately loosen each cookie with spatula if not using parchment paper. Let cool. Top each uncut cookie with the filling and a cut out cookie.